Home gardens in Canada have increased in popularity in recent years, according to the Canadian Museum of Nature. As more and more Canadians pick up their spades and trowels, however, they have also become more sensitive to the potential harm they may be doing with commercial garden products like chemical pesticides. One solution to their dilemma is to plant flowers native to Canada, with built-in resistance to the local pests and diseases, and built-in tolerance for the climate and soils. Although it belongs to the lily family, Canada mayflower (Maianthemum canadense) stands just 3 to 6 inches high. Native to woodlands, bog edges and floodplains from Labrador to Manitoba, it frequently forms colonies. 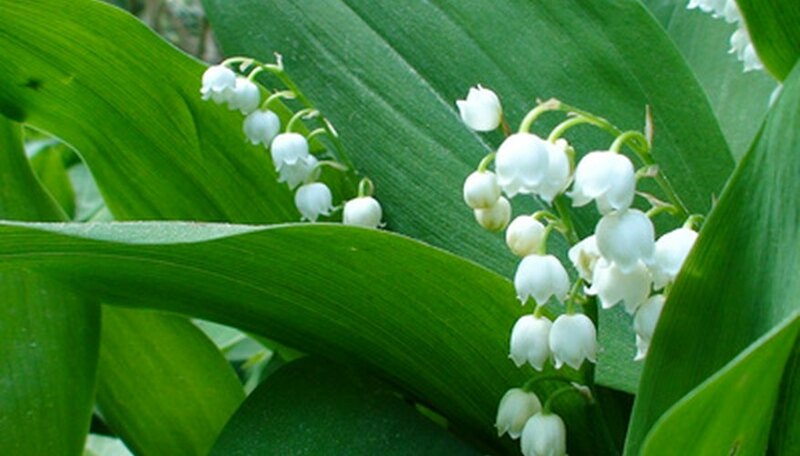 It is similar to lily-of-the-valley, and the plants have a pair of glossy, oval green leaves. Delicate stems rise above them, bearing erect clusters of small white flowers in May and June. Tiny, dull red berries follow the blooms. Canada mayflower, according to the Lady Bird Johnson Wildflower Center, works well as a woodland garden ground cover. Plant it in partial to full shade and acidic (pH below 6.8), moist humusy soil. It benefits from a winter leaf or evergreen needle mulch. Canada lily (Lilium canadense) grows wild in the meadows, thickets and wet woodlands of Nova Scotia, New Brunswick, Québec and Ontario. This ornamental plant stands between 3 and 8 feet high. It has flat, lance-shaped green leaves and a sturdy stalk bearing as many as 20 showy flowers in June and July. The downward-facing, nodding bell-shaped blooms range from yellow to red-orange. Plant Canada lily in cool, moist organically rich soil and full sun, advises the Lady Bird Johnson Wildflower Center. Canada onion (Allium canadense) is another lily family plant. Native to New Brunswick's pastures and meadows, it grows 8 inches to 2 feet high, with two or more green leaves. Growing from an onion-flavored bulb, perennial Canada onion flowers in April and May with 1 1/2-inch globes of small, white to lavender blooms. Use it as a meadow or prairie planting. It likes partial shade and dry, pH-neutral loamy soil, suggests the Lady Bird Johnson Wildflower Center. Bloodroot (Sanguinaria canadensis) is poppy family plant native to deciduous woods from eastern Québec to Manitoba. Each plant has a single leaf enclosing a single flower bud. On its own stem, the densely petaled, orange-centered white flower may open completely before the leaf unfurls. The blooms open on sunny days and close at night, according to the Lady Bird Johnson Wildflower Center. The green, round leaf may be 14 inches high. Plant bloodroot in partial to full shade in humus-rich, moist or wet pH-neutral soil. It will form an attractive ground cover beneath trees.